If you’ve been hurt as a result of negligence, call this West Palm Beach Negligence Lawyer. Negligence is defined as careless, reckless behavior. It can cause all sorts of harmful results, including injuries. Negligence is measured/judged using the reasonable person standard. That is, if a reasonable person wouldn’t have acted in the way than the person whose actions are being judged, then that person’s behavior will be said to be negligence. 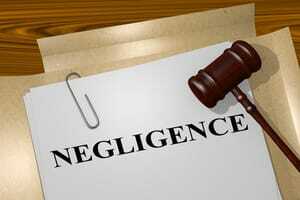 Negligence doesn’t involve intentional behavior like a crime. That is, in order to commit a crime, there must be some element of intent (referred to by the law as “mens rea”). Negligence doesn’t require this type of intent. That is, a negligent person can simply cause a mistake and injure somebody – rather than do anything on purpose. It is for this reason that a negligent person doesn’t typically face jail time. If the person didn’t intend to do anything wrong, then it would seem unfair to take that person’s liberty. As such, when somebody is negligent, they are judged in the civil justice system (rather than in the criminal justice system). In the civil justice system, the wrongdoer may be punished with a monetary judgment (but not the loss of liberty, jail time, or prison as in the criminal justice system). If you’ve been injured as a result of negligence, call this West Palm Beach Negligence Law Firm. Mr. Quackenbush will discuss your case with you for free. He can help if you’ve been hurt anywhere in Florida (including Broward County, Fort Lauderdale, Miami, and Miami-Dade County). Both criminal and civil cases use “standards” or “burdens of proof.” A standard or burden of proof is a way that the law measures evidence. That is, the law says that, in order to win his or her case, the person bringing the case must provide a certain amount of evidence to meet the standard or burden of proof. In a criminal case, the standard or burden of proof is “beyond and to the exclusion of every reasonable doubt.” In other words, in order to prove his or her case in a criminal case, the prosecutor/the State must provide enough evidence to prove that the accused is guilty beyond and to the exclusion of every reasonable doubt. If the State/the prosecutor can’t do this (i.e., the jury has a reasonable doubt about the guilt of the accused), then the jury must acquit the defendant. In a civil case, the standard or burden of proof is easier for the person bringing the case (i.e., the “Plaintiff” or injured person) to meet. After all, the standard or burden in a civil case is “preponderance of the evidence/greater weight of the evidence.” Essentially, this means that the plaintiff/injured person must prove that he is correct “more likely than not” (i.e., by 51%). That is, in a civil case, the jury doesn’t have to be convinced that the plaintiff is correct beyond and to the exclusion of every reasonable doubt – they only need to be convinced that the plaintiff is correct more likely than not. “Gross negligence” or “willful and wanton behavior” is negligence that is so reckless as to go beyond simple negligence. This type of negligence can be punished in other ways. For example, compensatory damages are the type of compensation that is typically given to the victim of simple negligence. However, in addition to compensatory damages, punitive damages may also be granted in a case involving gross negligence or willful and wanton behavior. Punitive damages, as opposed to compensatory damages, are designed to actually punish the wrongdoer – rather than to simply compensate the injured victim. In order to obtain punitive damages, Mr. Quackenbush will need to file a motion with the court – requesting that the judge allow you to pursue punitive damages. Call Mr. Quackenbush if you’ve been hurt due to negligence anywhere in Palm Beach County (including Belle Glade, Boca Raton, Boynton Beach, Delray Beach, Greenacres, Jupiter, Lake Worth, Lantana, North Palm Beach, Palm Beach Gardens, Palm Springs, Riviera Beach, Royal Palm Beach and Wellington). He will discuss your case at no charge.